When Hugo was diagnosed with terminal cancer in his late thirties, the surge of hopelessness that oppressed him and his family enabled him to recall the mystical memories of his childhood in Cuba. He longed for the tropical island whose crystalline waves fizzled with the spirit of the orishas, and when he closed his eyes in a creaking hospital bed, he could still feel the citrusy breezes that were infused with Shango’s whispers. He endearingly remembered his childhood caretaker, a lively and nurturing Afro-Cuban Santera, whose skin rippled like a coffee bean and glistened with the residue of coconut water. Her aging wrists were always stacked with a myriad of vibrant beads that rattled when she cooked, and her white cotton dresses splendidly contrasted the deep mahogany of her skin. As a fair-skinned boy of Spanish descent, Hugo was raised Roman-Catholic. The influences of his Afro-Cuban caretaker, however, left deep impressions on his spirituality and understanding of mortality. When death looked him in the eye, Hugo decided to reconnect with the “orishas” of his childhood. After fleeing his native island during the Cuban Revolution of 1959, Hugo moved to an American city that directly juxtaposed the Cuban tropics: Elizabeth, New Jersey. Not only had he been severed from his native country during a violent revolution, but he now found himself living in a foreign country with his wife, a young son, and terminal cancer. These adversities led Hugo to connect with members of a local church of Santeria. Hugo’s son recalls that the Santero priests agreed they would welcome Hugo into their church and “buy him a few years of life,” but his son would have to continue his father’s legacy once he passed away. Hugo and his son underwent a series of weeklong initiation rituals, and once they became official members of the church, Hugo began to visit the homes of religious healers, herbalists and botanists for physical and spiritual healing. As his cancer progressed and his body grew weaker, Hugo experienced a seamless flow of energy between his heart, mind and body that is known as “ache.” The herbal healing practices connected Hugo to all forms of life and empowered him to fulfill his spiritual mission on earth. These healing practices restored Hugo’s morale and inspired him to view the time he had left as an opportunity for spiritual development. After seven years of battling cancer with the support of his family and guidance of the orishas, Hugo passed away. Whether Hugo’s life was extended by the hand of hope, the orishas,or medicine is indeterminable, but his story exemplifies how Santeria can allow those who are immersed in darkness to see life in its full beauty. Santeria was born in the first decades of the 19th century when the Yoruban people of Nigeria were enslaved and brought to Cuba. In addition to working excruciating hours on sugar plantations, slaves were forced to convert to Catholicism and forbidden from worshiping their West African deities called “orishas.” While slaves were generally accepting of Catholic teaching, they did not feel it provided them with sufficient spiritual enrichment. Slaves that belonged to the same ethnic groups secretly formed “cabildos,” communities that would congregate weekly to dance, chant and worship the orishas. The syncretism of Catholicism and Yoruban religion began when slaves incorporated images of their deities into rituals and processions. This form of worship was quickly outlawed by Spanish plantation owners, however, causing slaves to mask the identities of the orishas with Catholic saints. Over time, slaves merged the identities of the orishas with the Catholic saints who they most closely resembled, creating a symbiotic relationship between the two religions. In order to continue their West African religious tradition, “the Catholic calendar was wisely utilized for the veneration of African saints,” said Charles H. Lippy and Peter W. Williams in the Encyclopedia of the American Religious Experience: Studies of Traditions and Movements. 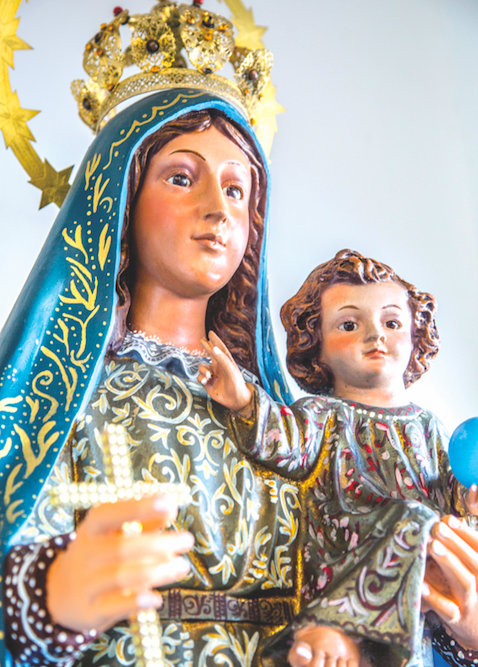 “The word Santeria itself means veneration of the saints.” Numerous efforts were made by the Spanish to suppress the connection between African gods and Catholic saints, but Santeria has remained an integral part of Afro-Cuban culture since the early 19th century. Some of the most well-known figures of Santeria are Saint Lazarus/Babalú Ayé – the orisha of suffering and contagious diseases – Ochún/Our Lady of Charity of Cobre – the orisha of love, beauty and femininity – Eleggua/Saint Anthony – the first and most important orisha – and Shango/Saint Barbara – the patron of power and virility. Each orisha represents different virtues and is connected to different forms of life, which are closely linked to the offerings one must make when seeking divine guidance. From the earliest days of Santeria until recent decades, the religion largely operated as an underground form of worship that was solely practiced in Afro-Cuban ghettos. Santeria was stigmatized by Cubans of Spanish descent because they viewed everything that was black as evil, and they ignorantly placed “Paleros,” who invoke the orishas for “brujeria” or witchcraft, in the same category as Santeros. The elimination of social classes in Castro’s Revolution would adjust this stigma, as exiled Cubans who were once wealthy factory owners now worked the same low-wage jobs as their previous employees. The Cuban Revolution of 1959 therefore sparked a boom in the growth of Santeria throughout the United States and Latin America. Non-worshippers may describe Santeria’s rituals as bizarre, superstitious or eccentric, but understanding the history of Santeria is essential to fostering an appreciation for this syncretic religion. Santeria is an enduring reminder of how slaves in Cuba were able to find glimmers of hope in an exceedingly dark condition, as they looked to the future while preserving their religious identities. The recent spread of Santeria throughout Latin America and the United States echoes how the original Santeros integrated new religious practices in the rituals of their homeland. 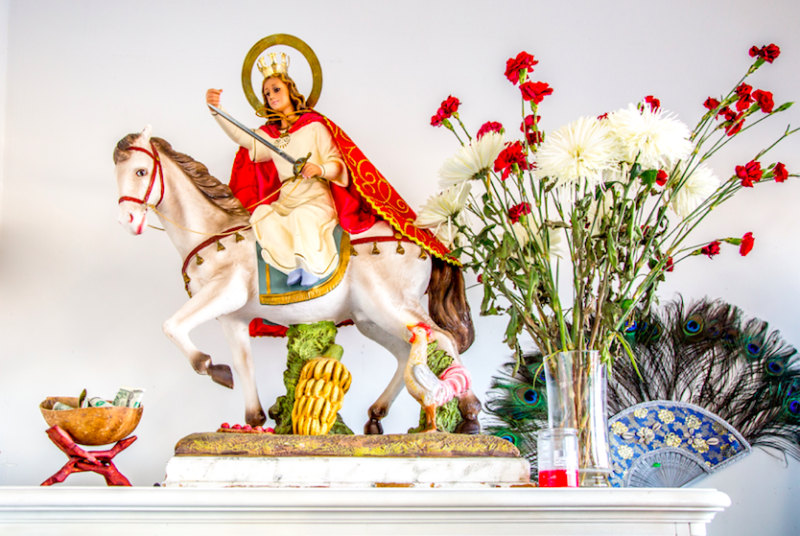 The growing presence of Santeria in Miami’s religious culture speaks to the trials and triumphs of the immigrant experience. Religion offers a sense of direction in situations that seem impossible to navigate, and the growth of Santeria exemplifies the notion that through hope, healing and perhaps even spiritual intervention, we can conquer our suffering. Stepping through the jingling glass doors of Botanica Nena, your nostrils are quickly invaded with the mystic aroma of Roman Catholic incense and fresh herbs. The register is crowned with pearly figurines of Catholic saints, and each wall is adorned with dangling webs of multi-colored beads and peacock feather fans. 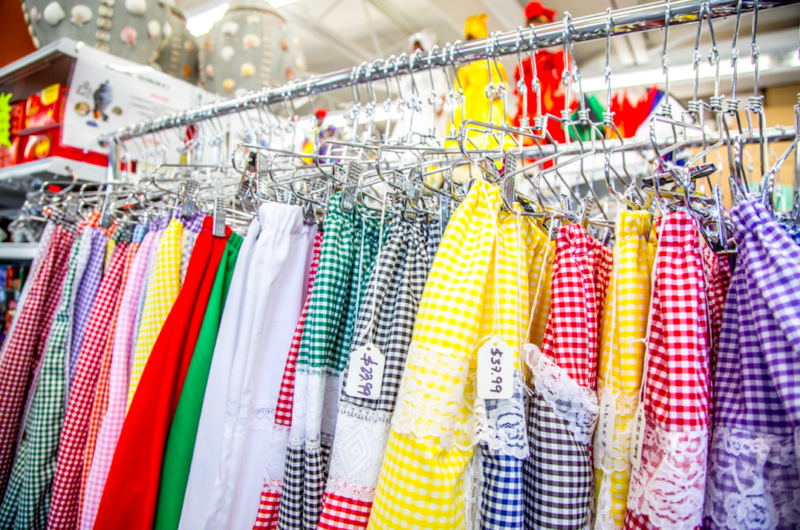 Just as the Santeros believe the orishas dwell inside “soperas” or soup bowls, the spirit of Cuba breathes through the rows of chestnut colored dolls whose skirts unfurl with tropical gaiety. 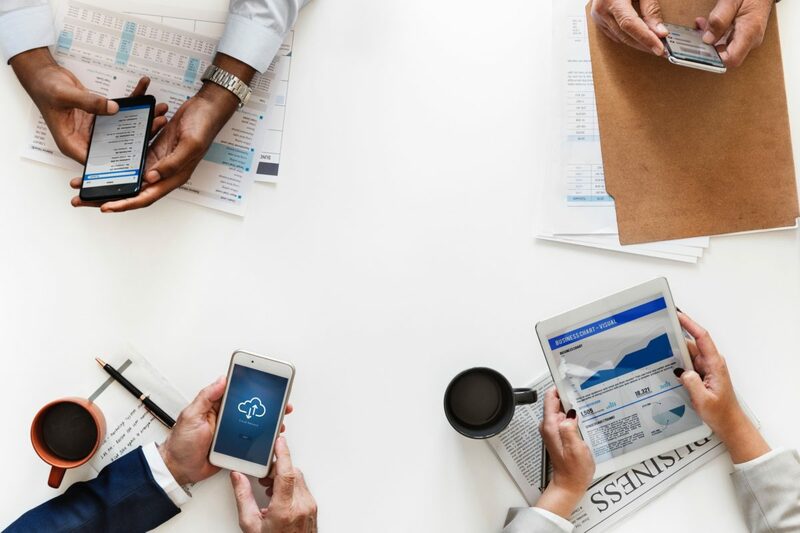 The employees greet you with welcoming smiles and are willing to give customers a thorough explanation of their products. They sell exotic Caribbean fruit such as breadfruit and other sweet offerings like molasses, coconut, honey, mango and coffee. 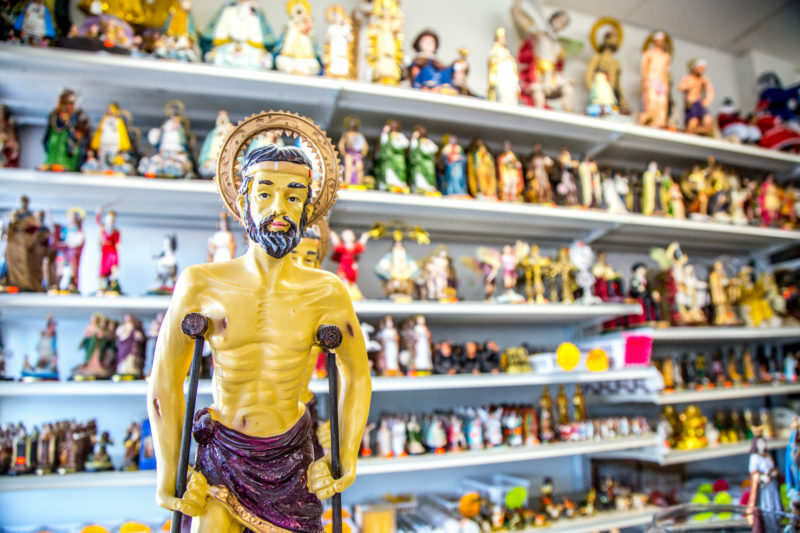 Botanica Nena’s extensive inventory and warm customer service makes this the ideal botanica to visit if you are looking to enhance your knowledge of Miami’s evolving religious culture. 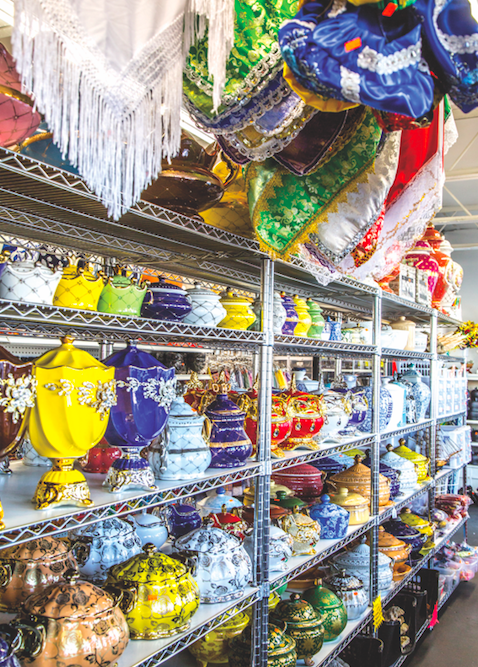 This botanica may give you the impression that it is merely a hardware store, but the chant-like clucking of hens and emerald cascades of herb plants gives it an unconventional mystique. The fusion of the hardware store and botanica serves as a symbol of how everyday objects meet the spiritual world in Santeria. This store epitomizes controlled disorder; aisles of sparking nails and machetes are interspersed between statues of Saint Barbara and Oshun. Visit this botanica if you are looking to experience Hialeah’s multiculturalism and splendid arbitrariness. 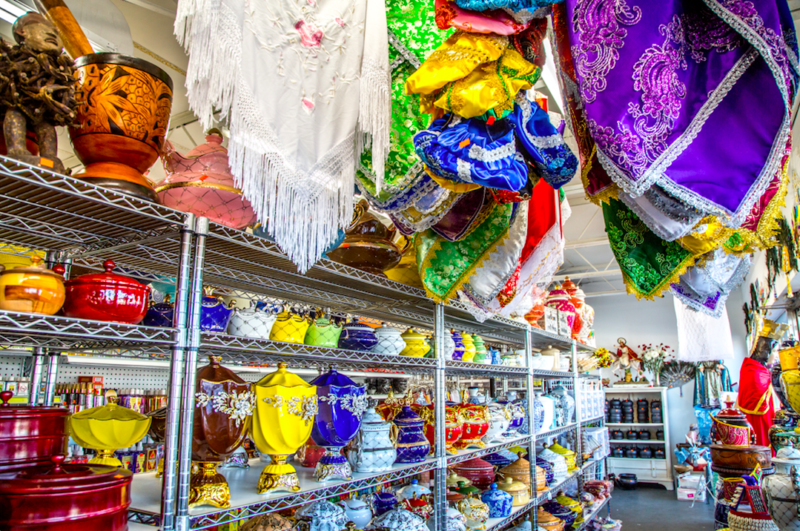 This botanica is nestled in a small strip mall on 13th avenue and Miami’s historic Calle Ocho. The store is illuminated by the warm glow of devotional candles and the swift passing of cars on Calle Ocho echoes inside. Although it is the smallest of the three botanicas, it sells Santeria’s essentials. 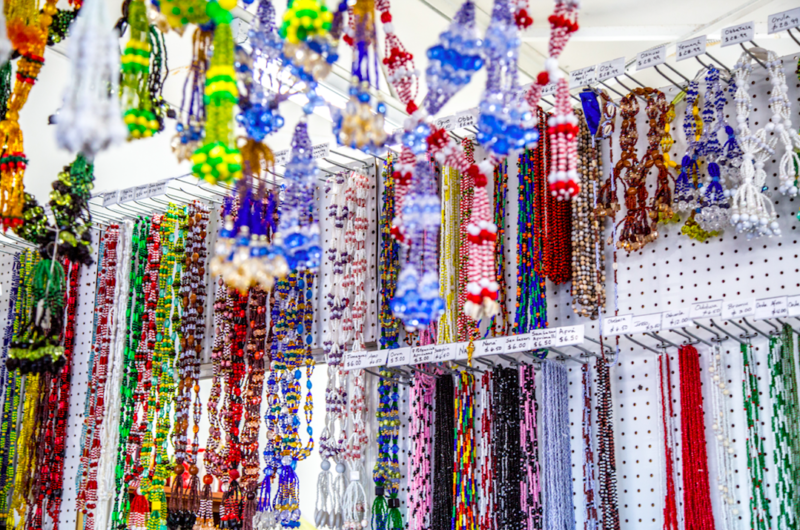 Towers of beads line the counter with small placards indicating which colors are linked to the orishas, and the vivacity of Santeria rituals is reflected in the racks of Nigerian tunics. One can find fruit offerings, soperas, white turbans, incense, rosaries, intricate African crowns and statues of Eleggua that range from the size of your palm to half of your body. This is a small neighborhood botanica whose supply is more limited, but most items used by Santeros on a daily basis can be found here. words_elisa baena. photo_gianna sanchez & sidney sherman.